"My teeth should be really healthy if I eat all these, right?" Tartar build-up can be a real problem for your furry friend, eventually leading to gum disease. Ideally you should brush your dog's teeth daily to remove tartar, but diet does play a part in preventing it. 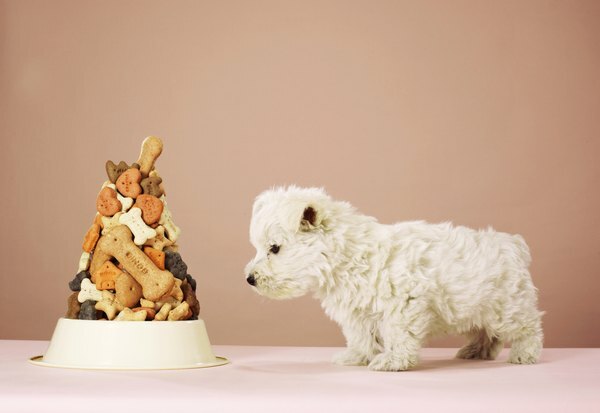 These crunchy homemade treats will help keep Fido's teeth clean and tartar-free. Preheat your oven to 300 degrees Fahrenheit. Measure the whole wheat flour, white flour, cornmeal, spinach powder, oats, bran and baking powder into a mixing bowl. Stir the ingredients with a wooden spoon to mix and to remove any large lumps. Pour the honey, water and peppermint extract into the mixing bowl with the other ingredients. Mix them well with a wooden spoon until the ingredients are fully combined and form a dough that's moist but not sticky. Roll out the dough using a rolling pin, to a thickness of roughly a quarter inch. Cut out shapes from the dough with a cookie cutter. A bone-shaped cutter of around 2 inches works nicely, but you can very this according to personal preference and the size of your dog. Gather together the dough scraps, roll them back out and cut more shapes out of them. Continue until all the dough is used up. Transfer the uncooked dog treats onto a baking sheet. (You may need two.) Put the treats in the oven and bake for 45 minutes. Turn off the oven but leave the treats inside to further harden for at least three hours, up to overnight. What Works to Get Tartar off of a Cat's Teeth?